from EagleTec. 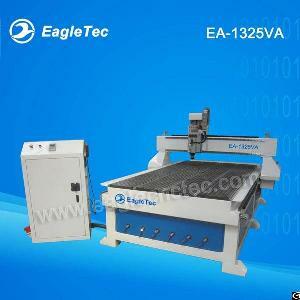 EA-1325VA is a basic cnc router machine with single air cooled 3.0kw Italian HSD spindle. Router table is perfect combination of PVC vacuum and aluminum t-slot, two in one design; it is not only vacuum adsorption table but also a clamp type table which is an ideal solution to meet the clamping requirements of different router working projects; size of table is 4x8 feet. The motion unit is adopted high torque Nema34 stepper motor 450B. Motion controller is user-friendly Richauto A11, which is an easy controller even for a beginner.